This 8 ft. ADA aluminum picnic table with welded galvanized steel has space available for a wheelchair at both the end and the side. This table fits perfectly into the ADA guidelines. It has anti-tip extensions welded onto the legs to ensure that the table won't tip over due to the overhang. Aluminum picnic tables are durable and lighter for easy moving when necessary for changing events. An economical choice for parks, schools, and HOA communities, this picnic table will handle years of use. 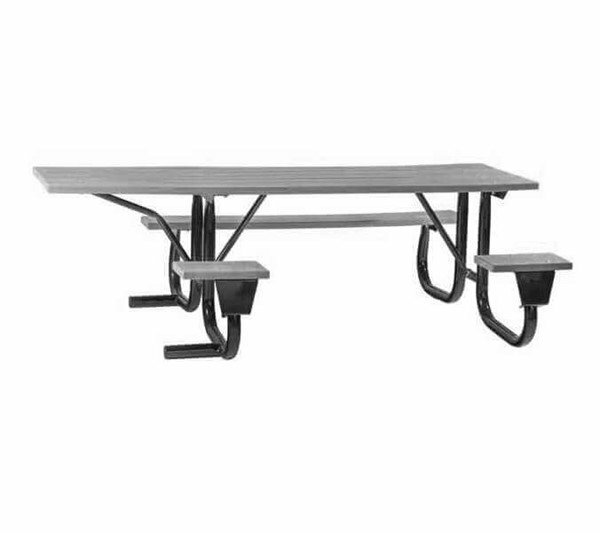 Welded frame picnic tables are low maintenance compared to picnic tables with bolted frames, as they do not require annual bolt tightening. Renaissance Park Backless Bench Recycled Plastic Slats and Cast Aluminum Frame - 4 Ft., 5 Ft., or 6 Ft.